Both my business and personal banking are online, saving me time and effort to run my company and personal finances. Getting an email alert from a bank can be a bit dramatic, as I found out this morning when the following message arrived. 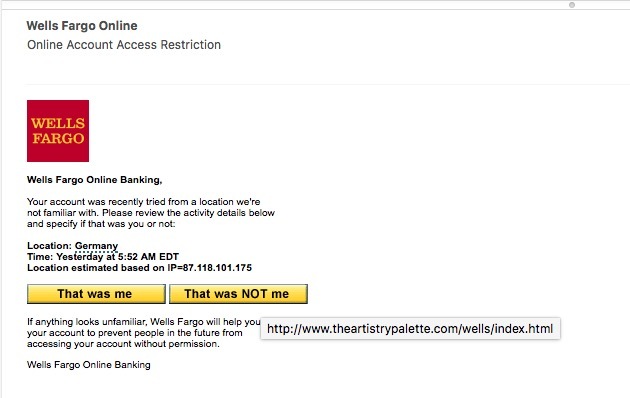 The final detail to help me realize that this was actually a phishing scam was that hovering my cursor over either button showed that the link was not going to www.wellsfargo.com, but rather another phishing web site that would certainly try and steal my real username and password to break into my real account. Be very suspicious of any email from a financial institution like a bank, because you need to be 100% certain that the email is coming from your trusted vendor and not a scammer trying to steal your identity.